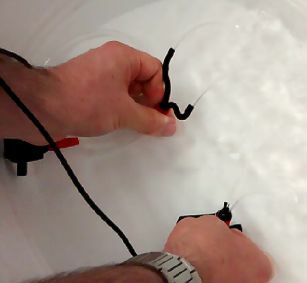 This project explored the possibilities for multimodal ambient displays inspired by haunted and paranormal phenomena, which are known to be intensely multi-sensory experiences. I created many different displays such as an animatronic moose head, a plastic potted plant display that vibrates in patterns, an animatronic minion that has moving eyes and can make giggle noises. These ambient displays filled a temporary installation called “The Living Room”. I also made sure that the different displays were remotely controllable, and I contributed to the Haunted Design Framework (see paper). Most of the ambient displays used Arduinos with an ESP8266 module that connected to an access point hosted from a Raspberry Pi. A Philips Hue bulb and blacklight bulb were connected to an Arduino Yún, so REST API commands could be issued directly to the bulbs from the Raspberry Pi. All aspects of the room could be controlled wirelessly from a laptop by SSHing into the Raspberry Pi and running commands. 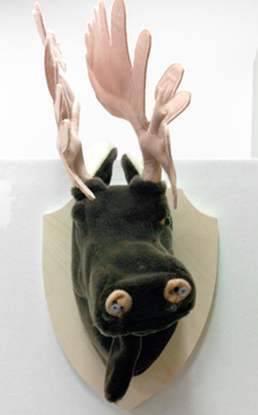 Assembled animatronic moose head. The fur came from a plush taxidermy moose head toy, which I destuffed. The antlers and snout could be independently actuated. Low-viscosity liquids could be programatically pumped through the moose’s nostrils. Internals of animatronic moose head. 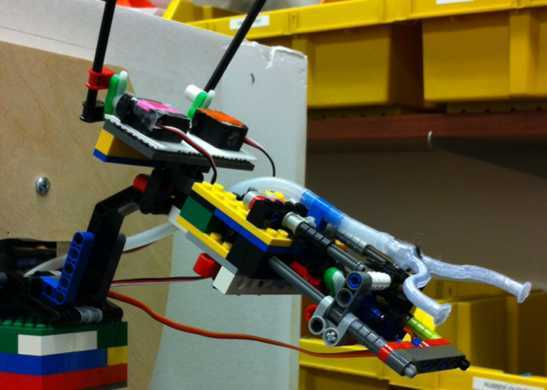 I made the moose head with LEGO, and 3D printed structural parts, servo motors for actuation, and tubing and a relay-controlled pump for bringing liquid out of the nostrils. Initial prototyping of 3D printed nozzles for the moose. I had to ensure that the nozzles fit the shape of the moose head, while not leaking or impeding liquid flow. 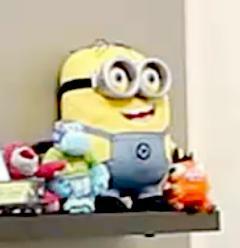 The assembled minion, derived from a commercial toy. Its eyes could be rotated in any direction, and it could be programatically controlled to giggle by leveraging the speaker that came with the toy before augmentation. 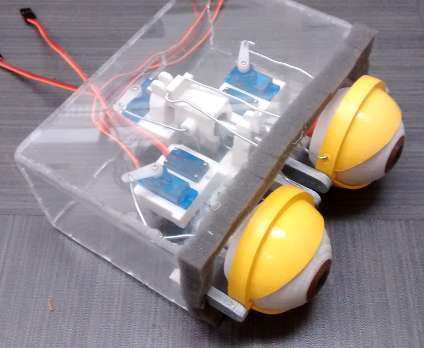 The eyes I used in the minion were a 3D printed mechanism adapted from Thingiverse. I painted them to look like the eyes of the original minion toy. I mounted the electronics for the minion within a small acrylic box, which I placed within the minion’s body. 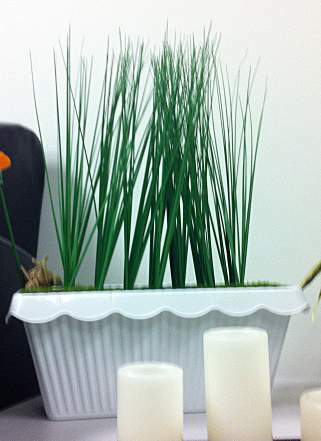 The actuated potted plant on display. I designed the display so that each cluster of grass could be programmatically vibrated to create patterns within the display. 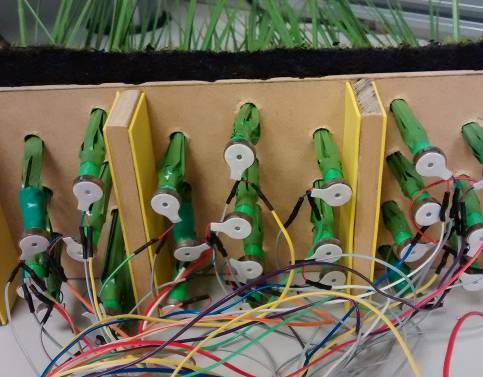 Vibration motors were individually glued to the ends of the plastic grass clusters. Foam was used for sound dampening. 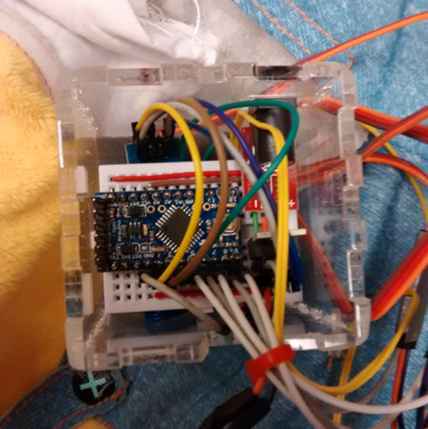 The vibration motors were connected to an Arduino Mega.